Bruce Petch and Dale Dodge, directors with World Neighbours Canada attended the recent BCCIC Leadership Award Ceremony for Suresh Shrestha, coordinator of Tamakoshi Sewa Samiti (TSS), and World Neighbours’ Canada partner in Nepal. 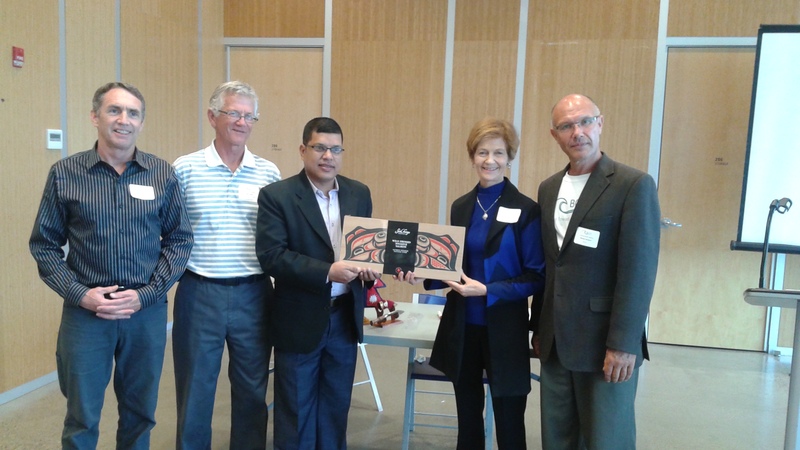 Vera Radyo, chairperson of BCCIC and Mike Simpson, executive director of BCCIC presented the award. 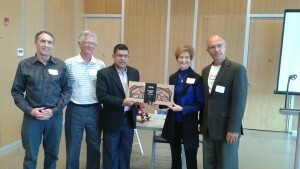 We, at WNC, are very happy to see Suresh recognized for his many years of involvement in the projects in Nepal. Suresh will be speaking at a number of locations in Western Canada over the coming week, including Oliver and Kamloops. Suresh will be sharing information about the water projects in Ramechhap, the effects of the earthquake and the political situation in Nepal. Details of the Oliver meeting ( September 23 ) have already been published and information about Suresh’ Kamloops engagement will be on the website later today.